Once your love has proposed and you say yes, the work begins. And we know that our #BlinkBeauties appreciate having the best women to help with the planning, preparations, emotions, and all those special moments. So here some of the best ideas for proposing to your bridesmaids, getting your bridesmaids and bridal party ready for the walk down the aisle, and – finally – thanking them all for helping to make your day extra special. Asking your close family members or best girlfriends to be part of your big day is a huge moment in your relationship and your life – one that you can turn into a very special memory with a little extra thought and effort. 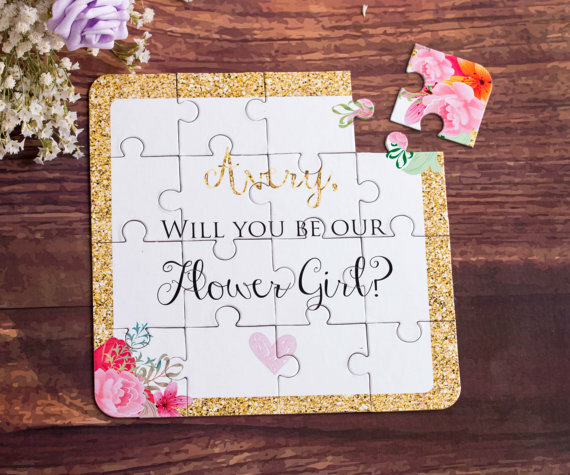 We turned to the Canadian wedding pros at Wedding Bells magazine and their 10 creative ways to propose to your bridesmaids. They have so many inspired ways to pop the bridesmaid question, and while we really liked the specially labelled bottle of wine, the wedding survival kit has just the right combination of fun and truthfulness to stand out. 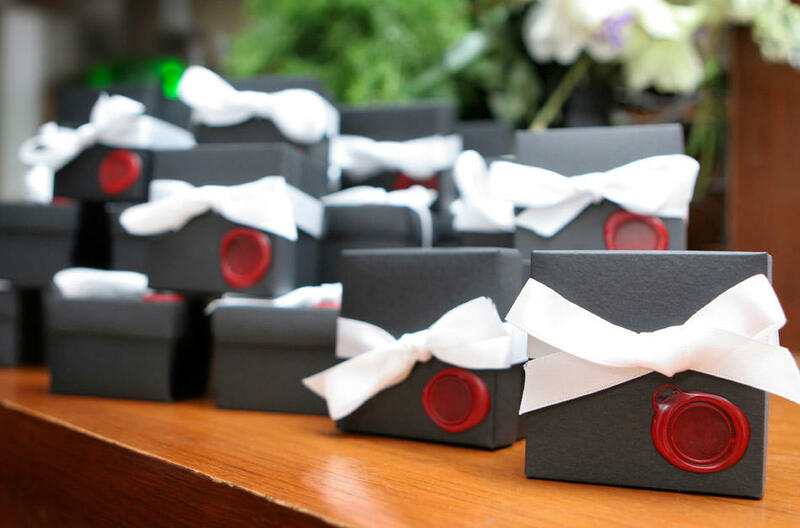 Giving a wedding survival kit is thoughtful and cute – filled with little sweets, lotion, and a bit of make-up. Plus it’s festive – with a tiny bottle of champagne to toast a new chapter in your lives and a formal note to ask this special gal to be in your wedding party. And remind them that when you’re in it together, anything is possible! The Wedding Planners Institute of Canada consulted wedding planners from across the country for their most unique ideas for asking friends or family to be in the bridal party. 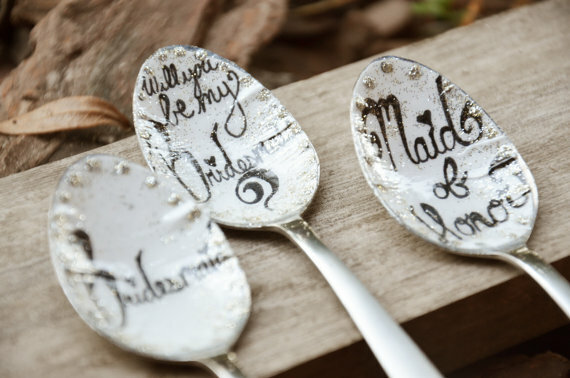 Check out these darling personalized spoons Carmen Luk of Devoted to You in Toronto gave to her bridal-party-to-be at an afternoon tea! Image c/o The Wedding Planners Institute of Canada Inc. 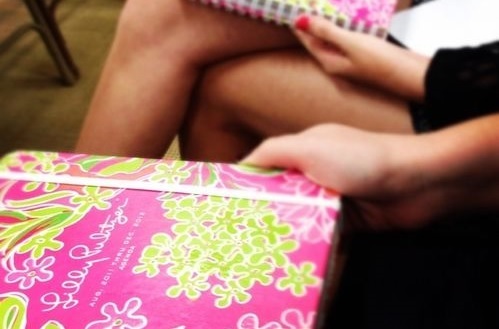 If organization and details make you happy, you have to OCD this cute idea we found on Pinterest: Get pretty planners for all the girls you want in your bridal party and have them ready for them (with all the important dates you know so far pencilled in!) when you ask if they will stand with you on your wedding day. In the weeks leading up to the wedding ceremony, plan to do something fun with your bridal party. We all hear the horror stories of Bridezillas and strained friendships, so make sure to focus on your bridesmaids and maid of honour and not just Your Big Day. Sure, you can chat about some details but all work and no fun is not the way to make warm, fuzzy memories! Your bridesmaids will likely plan your Bridal Shower and Staggette, but consider treating the whole bridal party to a fun activity, a day out together, some pampering! These will all help to keep the focus on your friendships and remind them that you’re grateful for their participation. 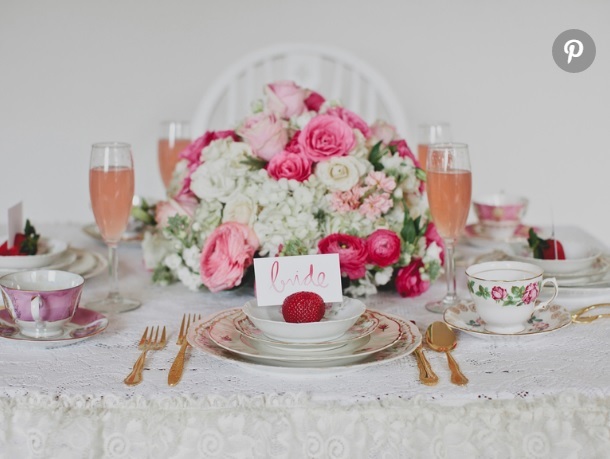 The Knot has some wonderful ideas for a Bridesmaids Tea that we think are super sweet. Make a day of it! Clear your calendars and head out for lunch, a little window shopping, and a treat like gelato or coffee. 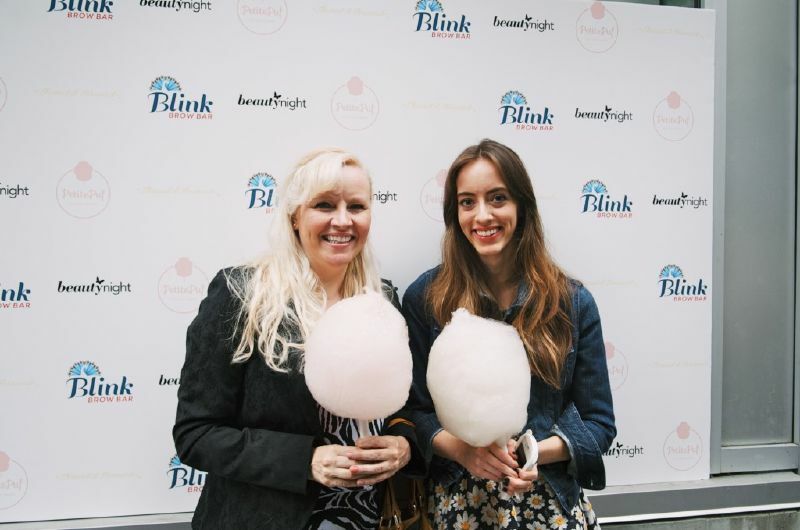 There are so many fab places to see near Blink Brow Bar’s location in beautiful Coal Harbour. If you take our advice, you’ll give your bridesmaids a little something when you ask them to share in your big day, but don’t forget to thank them after too. We turned to the lifestyle experts at Canadian Living magazine for tips on finding meaningful gifts for bridesmaids and the maid of honour. They didn’t disappoint! The key takeaways? Be practical and find something that they will treasure and actually use. Glassware etched with your wedding date might be a lovely idea, but will other people actually use it in the years to come (other than for your anniversary party)? Consider personalized gifts that mean something for the women themselves – perhaps matching pendants to wear down the aisle with their own birthstones. Accessories to wear for your wedding that will also work for other special occasions seem to be the frontrunner of thank you gifts. Consider local artisans when you’re looking for earrings, necklaces, or bracelets. Are you getting married? 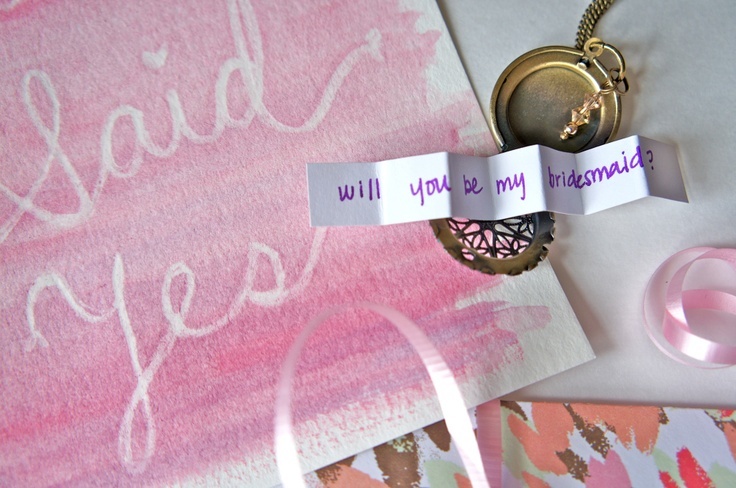 Share with us what you’re going to do to make things special for your bridesmaids. Already walked down the aisle? Tell us what you did or what you wish you had thought to do! Share with us now on Facebook,Twitter and Instagram. When you want to get ready for all those wedding photos, do what all the smart #BlinkBeauties and #BlinkBrowBros do: call Blink Brow Bar for an appointment or book online. Our Vancouver eyebrow threading shop is open daily at 577 Bute Street with eyebrow threading services starting at $21; eyebrow and eyelash tinting from $19; and facial + body waxing from $17.